This review is for the English version of Black Butler 11 (or Black Butler XI, if you prefer), published in October 2012. 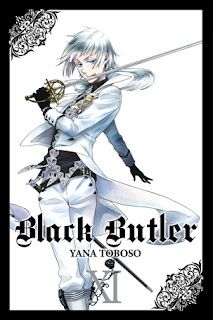 The Black Butler (Kuroshitsuji) manga is created by Toboso Yana and published in English by Yen Press. This time the action is split between what is effectively a post mortem of the previous story's events from Sebastian's perspective and the start of a brand new case. Although the synopsis makes it sound as though the new investigation is the focus of the volume, that's not true; tidying up all of the loose ends from the last book's murder mystery tale takes a while so there isn't all that much time left over at the end to begin the new adventure. As the murder mystery to which I refer was already neatly solved at the end of volume 10, it may seem strange to spend chapters going back to scrutinise what happened in detail - but that's exactly where Black Butler comes into its own. Sebastian's version of events is considerably more dramatic than the version the other characters (and the reader) originally experienced, and it's absolutely loaded with the dark humour which gives this manga its unique atmosphere. The exposition also grant plenty of opportunity for charming, antagonistic dialogue between Ciel and his twisted butler. I had come away from volume 10 feeling a little disappointed that some straggling plot threads had been ignored in the resolution, assuming that it was one of the weaker arcs and hoping that the next one would be better. Reading this epilogue changed my mind. So far, I've little to say about the new story, which involves a secret society on a cruise ship. The stakes are higher than usual with Ciel's investigation being hampered by the presence of his fiancée and it looks as though the arc will be another long one. Most importantly, the plot also requires Sebastian to briefly wear a doctor's lab coat. I have no complaints about that. There's nothing terribly original about the settings or stories in Black Butler, but when they're done with such flair the series makes a thoroughly enjoyable read. I've read complaints that Sebastian is too competent and it detracts from the suspense, and indeed there's little sense that either of the leads is ever in any real danger. When Sebastian is such an interesting character to watch, however, it's easy to forgive that minor flaw; I'm too busy poring over the fanciful depictions of the lives of Victorian aristocrats to care. As always, Yen Press have done a magnificent job with the English adaptation, including the alternate cover (and accompanying jokes) as well as generous liner notes. The one complaint I had with this volume in particular was with the way a line was translated. Ciel objects to a distasteful statement by blurting out the expression "Not hardly!". I believe that what he should have said is actually "Hardly! "; the negative version implies that he's agreeing with the original speaker (which I strongly doubt was the intent). Perhaps the phrase was accidentally altered during proofreading to try to make the dialogue sound more 'English' - which I suppose it does, superficially, except that it also completely changes its meaning. Yen's translated scripts are usually spot on, so I hope it was an isolated mistake which won't crop up again in future.